Vassi Loucaides and his son Paul opened Estia in April 2010. Vassi has been part of Perth’s food industry for more than 40 years, working in various restaurants following his immigration from Cyprus. His impressive culinary CV includes King Arthur’s Revolving Restaurant, then ownership of Casa Pepe, Maccas Seafood Restaurant, and of late the acclaimed Aegean Restaurant in Mt Hawthorn. What has been created is something that captures the beauty, flavours and seduction of Vassi’s homeland, the cradle of western civilisation. Whether you’re after a quick coffee, a working lunch, a dinner for two or a function (this is a Greek restaurant — big events are its specialty!) Estia hits the spot every time. Estia’s beautiful menu is carefully designed to provide an authentic taste of traditional Greek cuisine for the modern palate: Greece is a country of ancient beauty and myth, but this restaurant is anything but stuck in the past. Take the time to read the menu because a mouth-watering experience is guaranteed. Where else can you choose from a mezethakia menu that includes soft-shell crab, honey and ouzo glazed pork ribs and potatoes lemonates as well as famous staples such as dolmathes and piatela? 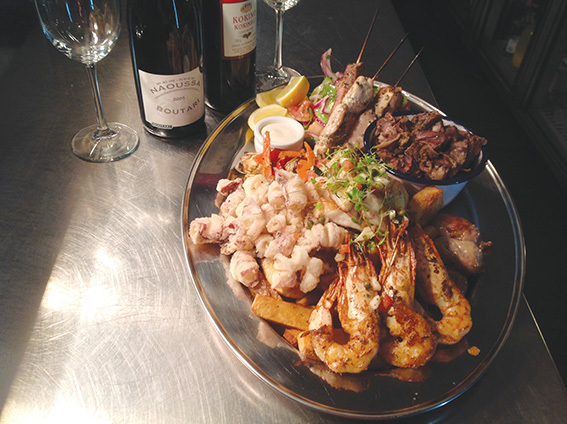 The extensive mains menu includes prawn saganaki and arni tou fourno alongside spanakopita, mousaka, lamb cutlets and slow-roasted pork belly. But then of course there’s the Meze Platter, designed for sharing with the table. What a feast! If you’re bored with weekend bacon and eggs, Estia has stunning breakfast menus for Saturday and Sunday till noon. Why not try the toasted pita (haloumi, fig compote and salata), or perhaps the omelette (sojuk sausage, spinach, goats cheese and tomato). If you’re a traditionalist you can even get the Zeus — the big brekky with bacon and eggs. Kids are looked after too, as is your sweet tooth, with a sensational dessert menu, including loukoumathes and galaktoboureko — but leave plenty of room because you may not be able to stop at one. 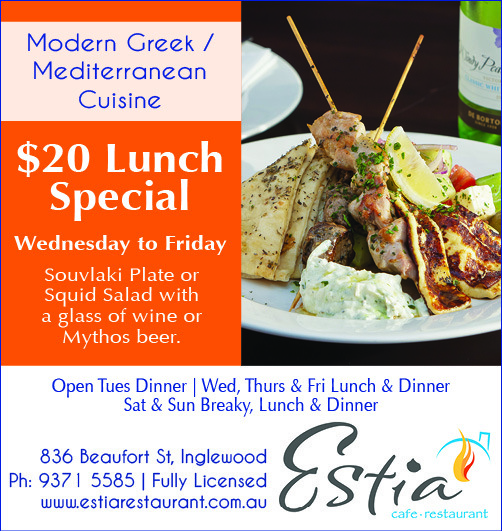 Of course, Estia is fully licensed with a range of beers, wines, liquors and ouzo, and serves superb Greek coffee. Make your booking today and check out the place that’s been described as “a breath of fresh air on the Beaufort Street dining scene”.